For today, I would like to share one of my favorite images! Honestly, it is probably one of my all-time favorite depictions of the Madonna and Child. And trust me, that is saying something! 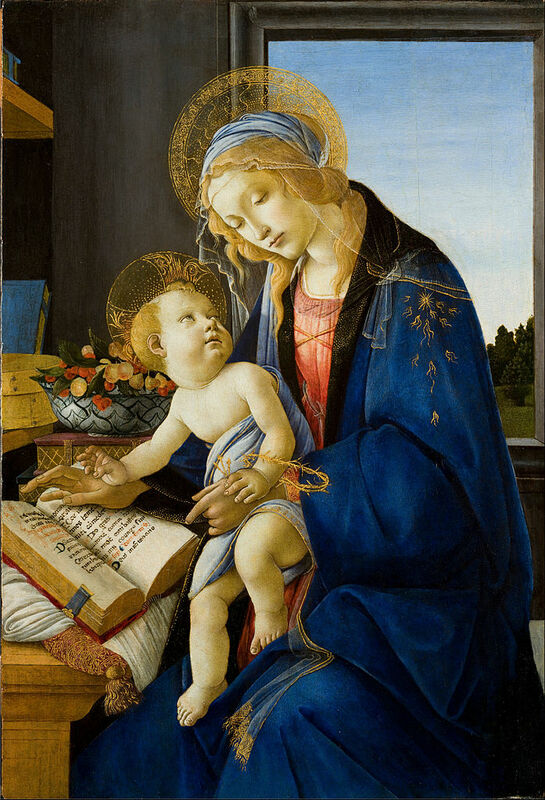 It’s called “The Madonna of the Book” and, as you can probably imagine, the Virgin Mary is reading a book! Virgin and Child (Madonna and the Book), by Sandro Botticelli, c. 1480. Museo Poldi Pezzoli, Milan, Italy. It’s a gorgeous image that I love for so many different reasons! For one, it recalls back to so many of the Annunciation pictures. In those Annunciation pictures, Mary is often depicted as being interrupted from reading scripture when the angel Gabriel comes to her. In this picture, we see Mary continuing to read scripture. Except now, Jesus, the Word Incarnate, is in her lap, looking adoringly up at her while she looks down at Him (or perhaps the book?) with a calm, patient look in her face. And that helps remind me how important it is to just set aside some time to think about God, as a mother. Having a kid that young is difficult. Even in a time with washing machines and dishwashers and all those modern conveniences at the touch of my fingers, it can be difficult to take care of an infant and maintain a house, let alone try to keep an active prayer life that is properly immersed in scripture. And in Mary’s time, it must have been difficult too — after all, in Jesus’s time, we hear about women going to the well (no instant running water; all water had to be carried back home). Plus, many depictions of Mary involve her with a depiction of some sort of domestic task — a spinning wheel, or perhaps a pile of laundry right next to her, or perhaps she is sewing. And then raising an infant was no walk in the park either, especially with Jesus — after all, not too long after the birth, Mary and Joseph had to flee to Egypt to avoid Herod’s wrath! Yet here she is, depicted as taking a break from all of that and reading scripture. And I love that — after all, isn’t that what we mothers should do as well? Then there’s the symbolism! Emblazoned on Mary’s shoulder is a gold star, symbolizing her role of “Our Lady Star of the Sea.” Why that title? Because she is the star that guides those to Christ! And even though life is tumultuous and sometimes we have lots of rough winds, if we look to Mary, we can always find our way back to Christ. But she is not the only one with something odd on her arm! Look at Jesus. Around His wrist, there is a golden Crown of Thorns and three golden nails, representing the nails that are driven in His hands and feet when He is crucified. So, even in this idyllic scene, where mother and child rest contentedly with each other, there’s a hint of the pain that is to come as He gets older. And that can be difficult. Right now, my three-year-old daughter likes to remind me that “soon she will get older” so she can do all sorts of new things that she is currently not allowed to do — like cut onions and repair all the books she breaks. She is excited about it, of course! Yet, it makes me nervous. After all, I know that, as you get older, often life can become more painful. And these image reinforce that idea. Yet those symbolisms, taken together, remind us to look at Christ as we encounter our own difficulties. And, if we are having trouble looking at Christ, then we can always turn to Mary, who will direct us back to Christ. And that is a good reminder indeed! What was the first thing you noticed when you looked at the picture? Why do you think that imagery caught your eye? How do you fit time in your own busy life to focus on God? In times of your own difficulties, how do try to focus on Christ? Help us love You more by guiding us to Your Word. When we struggle, direct us back to You. This artwork is featured in my new book, The Joyful Mysteries! To take a sneak peak, click here! Lovely inspiring article. All so true. Nollaig Mhath to you, your husband and your beloved children.